I am partial to a bit of mulled wine, especially on a chilly evening curled up on the sofa. Mince pie for me please – preferably warmed with brandy cream! What is the item you are sharing with us today? 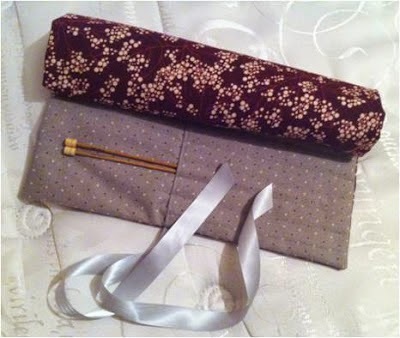 I’ve chosen to share with you a knitting needle roll. This is a great present for anyone who knits, and could also be adapted, for example to hold crochet hooks or sketching pencils. I have given this as a gift to a number of people and it has always been well received. I try to choose fabrics that I know each person will love, which makes each version unique. You can find out more about them here. I've had one of these on my 'to craft' list for ages! Your fabrics are lovely. What was your inspiration for this item? Anyone who knits will know how easily knitting needles go missing or get separated from their partners! This seemed like a great solution, and although it sounds a bit grand to say I designed this, as it is so simple, I basically had the idea in my head and stitched it up! When I was younger I did a bit of sewing from time to time, but it wasn’t until about 4 years ago that I took it up properly. I went to a course at John Lewis to start me off, and then once I got my first sewing machine I learnt a lot online, particularly through blogs and sewalongs. Ooo, our cat is always causing havoc! So where can Crafty B’s find you online? I am on Facebook as KraftyKat, Twitter as AKraftyKat and Instagram as akraftykat. I love connecting with people on social media so give me a shout! I'm sure the Crafty B's will be popping across to visit you. Any big plans for 2015? I’m getting married in April so a lot of my crafty activities are focussed on that at the moment. 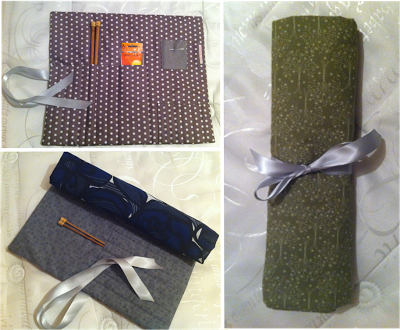 I have set myself some ambitious challenges, including sewing my bridesmaids dresses, which will keep me busy. After that I look forward to getting to work on some of the lovely patterns in my ever-expanding collection. I am looking forward to spending this Christmas at home with my friends and family. We live all over the country so it is a good opportunity to get together and catch up. My mum cooks a great Christmas dinner with all the trimmings although I think my favourite is the boxing day buffet which consists of a huge range of tasty treats including my mum’s homemade cheesecake. We always have a chocolate log and my brother and I always argue over who gets to have the end – we never seem to remember that there are two! My favourite Christmas traditions are those we have as a family, I love the predictability of Christmas. Also my friends and I always meet up for mulled wine, mince pies and gossiping – a tradition that started when we were in school and is still going despite the fact that there are now partners and babies involved! I love the run-up to Christmas – drinking mulled wine, seeing friends, preparing and buying gifts, singing carols. I look forward to it every year! … probably much later than planned! … my sewing machine as it opened up such a world of possibilities. … oooh I don’t know – I’m sure there was some dubious clothing received in my younger days! … the traditional turkey with all the trimmings. … spending times with my friends and family. … Fairytale of New York by The Pogues. … the angel I made in nursery school which still tops my parent’s tree every year. … I couldn’t pick just one. Thanks for joining us Kat, is been great getting to know you and good luck with all the wedding prep! Sounds exciting. we hope to read about it on your blog. Have a lovely Christmas and enjoy the mulled wine.